If your car won’t run, requires more money for repairs than you think it’s worth, or if you’re just reluctant to sell it on the private market because it’s no longer safe to drive, you’ll need to deal with salvage yards to get rid of it. Dealing with salvage yards can be intimidating for most people, because you know very little about how their business operates behind those barbed wire fenced-in lots. That’s because you’re dealing with a disadvantage called asymmetrical information. Asymmetrical information is a fancy way of saying that you’re making a deal with someone that knows a great deal more about what’s at stake than you do. There’s even a law of economics named after asymmetrical information in the used car market: The Market for Lemons. A lemon is an expression for a car that is fundamentally defective. So if you go to a used car lot, you have to wonder if the car you’re buying is actually worth the money on the sticker (or even half that value). The car dealer doesn’t have to wonder—he knows the history of the car, and exactly what they had to do to patch it up for the sale lot. And since only one side has hard information about the deal, it’s asymmetrical. The owner of the salvage yard is like the opposite of the used car dealer. He won’t try to convince you that your car is worth more than it is. It’s in his favor to tell you that your car is worth less than it really is. Most consumers have no idea what a junk car is worth, so all the information is on the salvage yard owner’s side. If he knows your car is valuable, but also knows that you have no idea that it is, or why, he can quote you a very low price. He’s giving you the reverse lemon treatment that some auto salvage yards. Don’t go for it. If your car still runs, or requires only a few repairs to get it running again, it might be sold to dealers at auctions. Buyers at auctions are looking for cars that can be repaired and put back into service at a profit (or even sold as a lemon!). If you’re getting rid of your car even though it runs, it’s probably worth more than scrap value at auction. And if your car runs, you should make it clear to the salvage yard that you know the car has potential for an auction sale. Few people have the desire or the know-how to take apart a car and sell the parts one at a time. That doesn’t mean you shouldn’t know what those parts are worth to the dealer. If you read a list of all the valuable items on your car to the salvage yard owner, they’ll understand that you know what the car is worth to them, and will price it accordingly. All undamaged parts on late model cars that are totaled in an accident, including body panels. No matter what, your car can be recycled as scrap metal. There’s a lot of steel in a car’s body, motor, and frame that can be recycled. You can find out the weight of your car, then find out how much scrap steel is going for in your area. You should never go lower than this value when bargaining. You don’t have to threaten to sell all these parts on your own when dealing with the salvage yard. Just let them know that your car has valuable parts on it that make you think it’s worth more than a lowball offer. Look up the Blue Book value of your car if it was in running condition, even if it’s not currently running now. There are two reasons for this. One, it lets you know what the car might be worth if it went to auction and was repaired. Secondly, the value of the car is used to determine the tax deduction you’d receive if you donate the car to charity instead of sending it to the salvage yard. Pointing out the difference between the salvage yard’s offer and the car’s value as a tax deduction might get them to raise their price. Most people are very vague when they ask for a quote from a salvage yard for their junk car. You should list all the valuable components, then attach clear digital pictures, including the interior and under the hood, then offer to send them to the email address of the salvage yard. Without good information, dealers are forced to offer you the lowest possible price because they don’t know how much they’ll be able to salvage from your car. 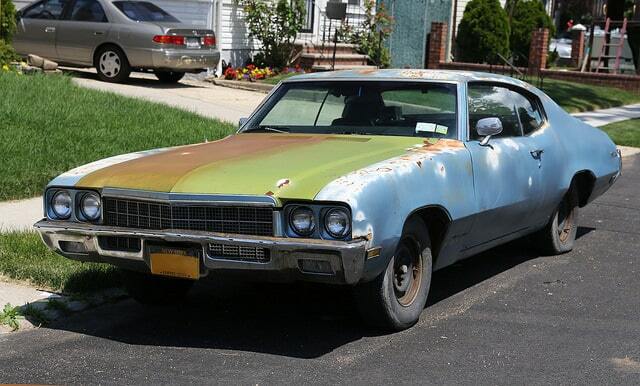 If your car is valuable, and you can prove it, then you’ll receive higher bids on your junk car. Don’t bother driving to salvage yards if your car is running. That’s their turf, and you’ll be at a disadvantage. You shouldn’t restrict your search to only three salvage yards, either. Once you compose an email with a list of your car’s important features and pictures of the car, send it to as many salvage yards as you can find online that serve your area. Don’t leave any wiggle room in a quote for your car. When a salvage yard comes to pick up your car with a flatbed truck, if they begin to back away from the offer they made over the phone or by email, that’s a good indication that they’re not a reputable business. Remember: Don’t sign the title over to anyone until you have cash or a check in hand for the full amount.